I love caramelized onions. Sweeter than sautéed onions, they make a great topping for pizza and a nice addition to soups and sauces. Caramelizing uses low, steady heat to break down the onions’ starches into sugars. Continue applying heat, and the sugars turn golden and more mellow in flavor—just as when caramelizing crystalized sugar. The challenge is that it’s easy to mess up the process on the stove top, either by using too-high heat and burning the onions, or by getting impatient and not cooking them for long enough. Since my earlier experiment with sautéing onions in the slow cooker turned out so well, I decided to give caramelizing a try and was very pleased with the results. Coat the bottom of the crock pot with a little olive oil. Added chopped or sliced onions until the crockpot is full. For my 3-quart crockpot, this took about 6 pounds of onions. Cook for 8-10 hours, stirring from the bottom of the pot once an hour. 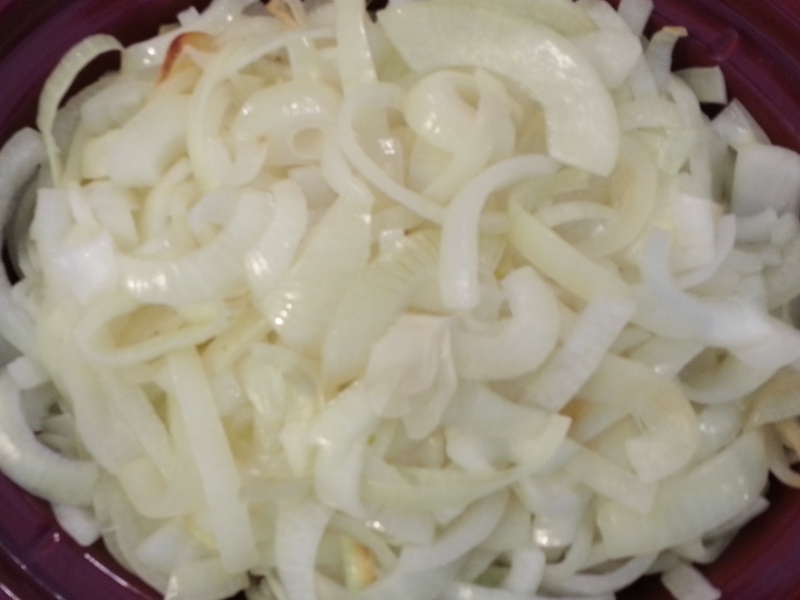 This is what yellow onions should look like after the first hour: As they continue to cook, the onions will reduce in size until they fill the pot only about half way. This is normal and nothing to worry about. Stick the onions in the refrigerator for at least an hour before chopping. This helps prevent release of the compounds that cause crying when chopping onions. Tearing up isn’t a big deal when copping just one onion, but when chopping enough onions to fill a crockpot, it’s nicer to avoid it. If you don’t like your house to smell like onions, this is a good project for a day when it’s warm enough to open the windows but not too warm to have the crockpot on. Another option is to cook them on a covered patio. Freeze onions in ice cube trays. Thawed cubes make a great addition to omelets, sandwiches, quesadillas, potato salads, and more. Wow! This is a great idea, especially if you can freeze them afterwards. I'd like to repost this for my allotment friends if that's ok? It's perfect for an onion glut.